This episode’s guest is Craig Newmark, founder of craigslist. While he still considers himself a “customer service rep” for craigslist, most of Craig’s primary focus is craigconnects, which he launched in March 2011. The mission of craigconnects in the short term is to promote and enhance the use of technology and social media to benefit philanthropy and public service. He uses the craigconnects platform to support effective organizations working for veterans and military families, open government, public diplomacy, journalistic ethics and accountability, fact-checking, consumer protection, election protection and voter registration. He is a LinkedIn influencer with more than 700,000 followers on LinkedIn. He is also on Twitter at @craignewmark. This episode is devoted entirely to a very special guest: Craig Johnson, the author the Walt Longmire mystery series. Craig’s books are the basis for the hit A&E drama, Longmire, starring Robert Taylor, Lou Diamond Phillips, and Katee Sackoff. His latest novel in the series – By Any Other Name – just published in May and rose to number six on the New York Time Best Seller list. Popular in the US and Europe, The Cold Dish was a Dilys Award finalist and the French edition won Le Prix du Polar Nouvel Observateur/BibliObs. He has been honored with the Wyoming State Historical Association’s Book of the Year, France’s Le Prix 813. He’s a Western Writers of America’s Spur Award winner and the Mountains & Plains Independent Booksellers’ Book of the Year. The Dark Horse, the fifth in the Walt Longmire series, was a Publishers Weekly Best Book of the Year. Hell Is Empty, selected by Library Journal as the Best Mystery of the Year, was a New York Times best seller, as was As the Crow Flies. Johnson lives in Ucross, Wyoming, population 25. For fans of the series who have not read the books I highly recommend you do so! Craig Johnson is active on social media with a Facebook fan page with more than 10,000 likes, and a Twitter account (he participates in Twitter chats on occasion). You can connect with Craig on social media through his Facebook page. His Twitter handle is @ucrosspop25. For more information on Craig, check out his website. It’s an amazing interview and a lot of fun. Enjoy! This episode I cover a new initiative at LinkedIn that allows their employees to perform Random Acts of Kindness. More info on this in a LinkedIn blog post from Rachel Diamond, LinkedIn’s Employee Experience Lead. Plus I’ll share a post I published on LinkedIn on why you need to take the meeting. My guest this week is Kathy Bernard. Kathy is a public speaker, LinkedIn expert and LinkedIn profile optimizer who trains companies on how to use LinkedIn for selling, recruiting and fundraising through her LinkedWISE.com business. She is also the creator of Get a Job Tips, a step-by-step site that helps the unemployed and miserably employed, as well as college students, land the jobs they want. She has received 33 awards for communications excellence and has a knack for translating complex concepts into powerful action steps to help you sell, recruit, fundraise, or get a job using LinkedIn. More about Kathy can be found on her LinkedIn profile. 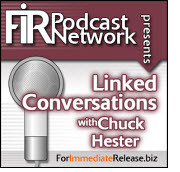 This episode I cover significant changes made in the LinkedIn Premium subscriptions. The features include a larger photo, more prominence in search, and a profile background feature similar to Twitter’s backgrounds. No guest this week, but I will be sharing a blog post on how small businesses can use LinkedIn. This is one of many posts I have written using the LinkedIn Publisher feature that is slowing being rolled out to LinkedIn members. Check out my other posts here. This episode I cover the latest tool in your LinkedIn toolkit – the How You Rank feature, where you can see how you stack up against your connectionss for profile views. My latest blog post using the LinkedIn Publisher feature talks about the three things you must do on LinkedIn right away. Check it out, along with my other LinkedIn posts here. My guest this week is Kathy Klotz-Guest, founder of the marketing firm, Keeping it Human. Kathy helps companies and executives turn marketing-speak into compelling human stories that customers act on. She is also the host of the popular marketing podcast, Jargonorrhea Live - a Viral Marketing Show, when she’s not eradicating the world of jargon-monoxide poisoning and creating content with a human touch. Kathy has an amazing LinkedIn profile, and uses multimedia to tell her story. Be sure to take a look at what Kathy is doing. A good friend for many years, our conversation was like sitting down with her over a drink and enjoying each other’s company. Hope you enjoy it as well! This episode I cover the newest LinkedIn feature: LinkedIn Publisher. Publisher is being rolled out slowly – about 25,000 users at a time – and will enable LinkedIn members to blog directly on the LinkedIn platform. I have started doing just that with my first post on why I use LinkedIn every day (surprise!) hitting more than 5000 views. To put this in perspective, on a good day a status update I post on LinkedIn averages around 500 views. You can check out all my LinkedIn posts. My guest this week is Lisa Curtis, the CEO of Kuli Kuli. Lisa is one of the many amazing people I got a chance to meet at the Natural Products Expo West. Kuli Kuli was founded to support women’s moringa cooperatives in West Africa by selling a small percentage of their moringa harvests in the form of moringa superfood bars in the United States. The company was named Kuli Kuli after the peanut paste that Nigeriens mix with moringa leaves to make them taste good. You can learn more about Kuli Kuli on their website and through their Facebook and Twitter pages.